Blogging is a passion for many. Some people blog to document their thoughts and ideas while others do it for a specific purpose. In my opinion, everyone should blog whatever may the reason be. It’s a great way to reignite your thought process and connect with the ever-changing world. Interested?Great! This tutorial will help you to a start a blog for free, RIGHT NOW! Writing a blog is just the part of the blogging story. You need a way to get it on the internet for the audience to read. The good news is, there are many free blog sites where your ideas can be expressed without spending a single penny. WordPress.com is one such blogging platform that provides quick and easy setup for writing and publishing the blogs. If you are starting your journey as a blogger, WordPress.com is your go-to place. 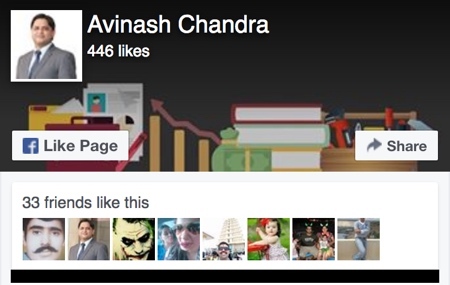 Its user-friendly interface helps you publish your blog in less than 30 mins. Its enormous number indeed. WordPress is a platform used by many professional bloggers worldwide. 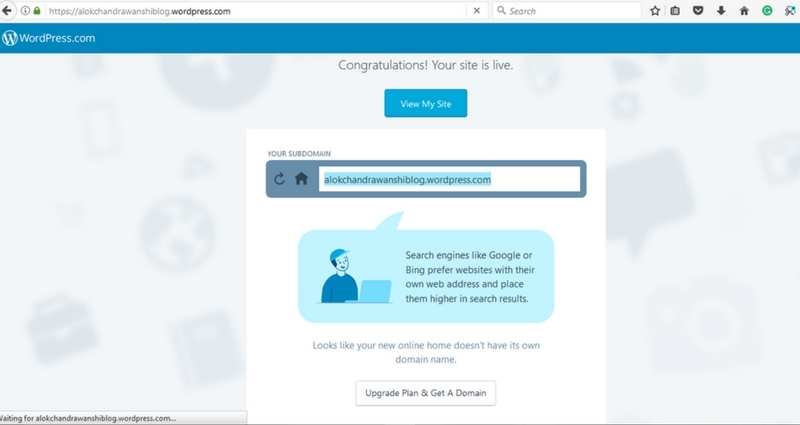 It has some essential and unique features that many blogging platforms are yet to incorporate. It is highly scalable and provides many theme options and plugin support. Currently, WordPress.com offers 2600+ themes(2) and 31,000+ plugins(3) for free. The aforementioned features are good enough for any blogger to join WordPress.com for free to start a career in blog writing. If you want to compare other free & paid blogging platforms with wordpress.com you can read that here. 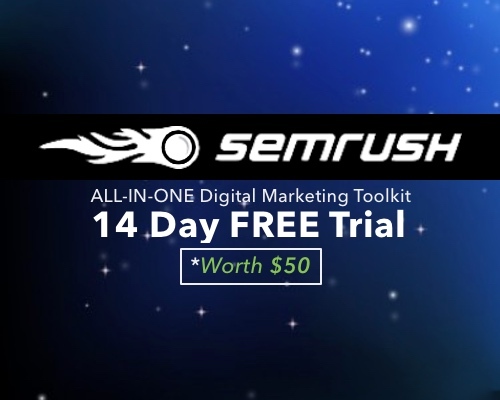 However if you are looking for only free blog creation & hosting options read this. It’s effortless to start your blog with WordPress.com even if you are not from a technical background. Let us walk you through step by step procedure to create your first blog for free. 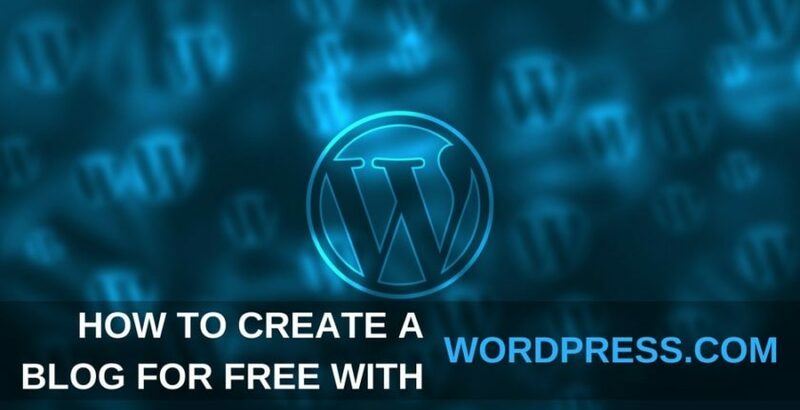 The first step to your blogging journey starts with registering yourself with WordPress.com to create a free account. 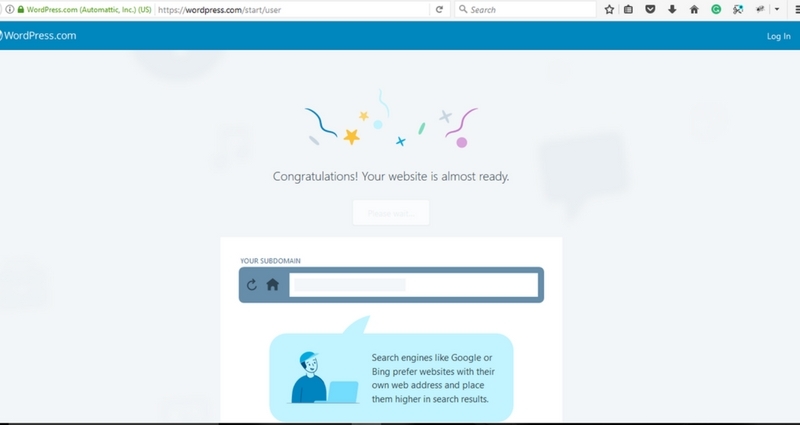 Browse to the home page of WordPress.com. Click on the Login button at the top right of home page. You will be presented with the below screen. Fill in all the details asked. Name of your site: Select a name for your site. Be creative! Let it reflect what your blog or website will be about. Tell wordpress what your site will be about: Money, fashion, how to train your dog maybe, or perhaps fashion for the plus sized? The ideas are limitless! Check out our awesome and very popular business ideas lists. The primary goal for your site: Based on the primary goals of your blog wordpress will suggest the setup. Choose as many or as few as you like. Do have expertise in creating websites: Choose how comfortable you are creating your website with wordpress.com depending on whether you have any previous experience. Thats it now click on continue and move to the next step. If you have an existing WordPress account, you can Login directly. By default, WordPress provides free subdomain for your blog for example – myblog.wordpress.com. You need to type in the domain name of your choice and WordPress will prompt you if it is available or not. It will also suggest you some other domain names that you can choose from. You can even buy a custom domain name if you wish. But we suggest that if this is your first blog just go ahead with the free option. It is essential to choose a category; your blog falls into. You will get many options to pick from. Select the one that is appropriate for your blog. Remember, based on the category you choose here; you will be presented with theme options later on. 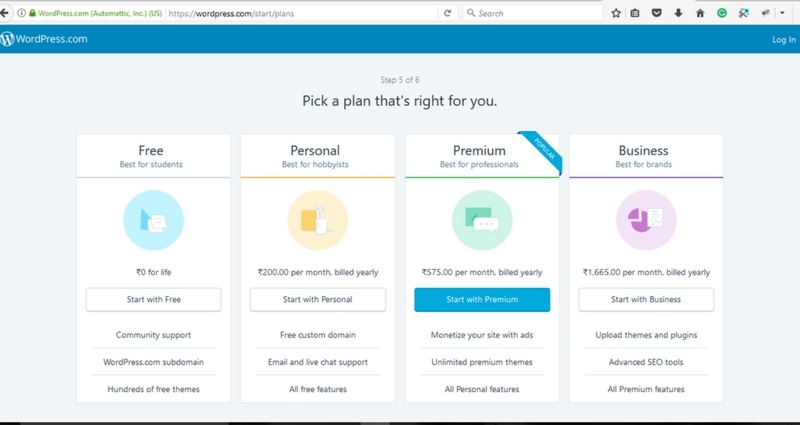 Based on the plan you choose, WordPress offers you some specific features. 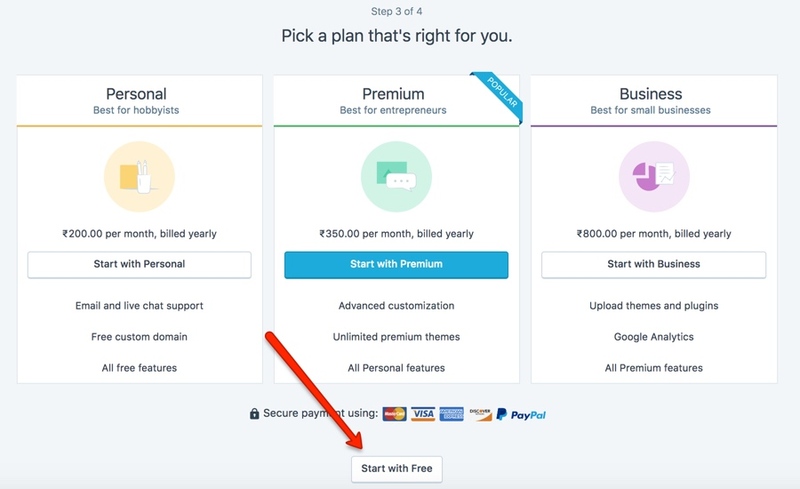 You can choose a plan from below shown options: Free, Personal, Premium and Business. All the plans (except free) will enable you to choose your own custom domain. Premium and Business plan provides you with multiple plugin and theme options to extend your website capability. You can also customise your site to a great extent with these plans. We suggest that if it is your first time your choose free. If you are logged in, click on the first option that is free. If you are not logged in, just scroll down till you find the start with free button. 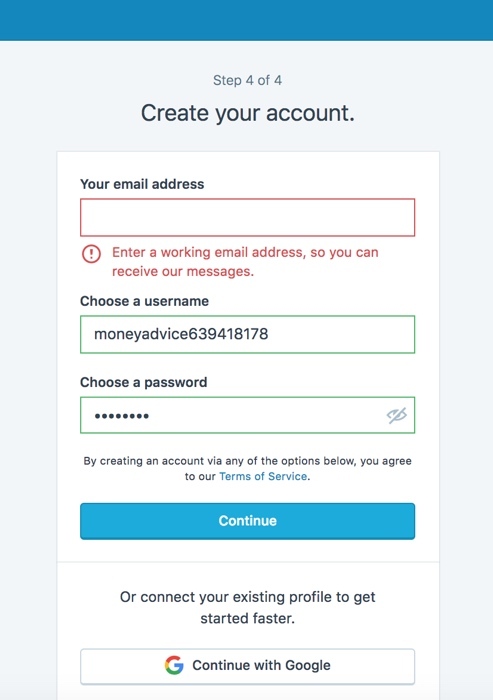 You’ll need a valid email address (that has not been used to create another WordPress account) to sign up for a new WordPress account. Enter the required fields and click continue. Once your sign-up is complete, you will see a success page. Your site is live now. Click on “Visit My Site” button to go to your blog site. This is how the default blog page will look like. 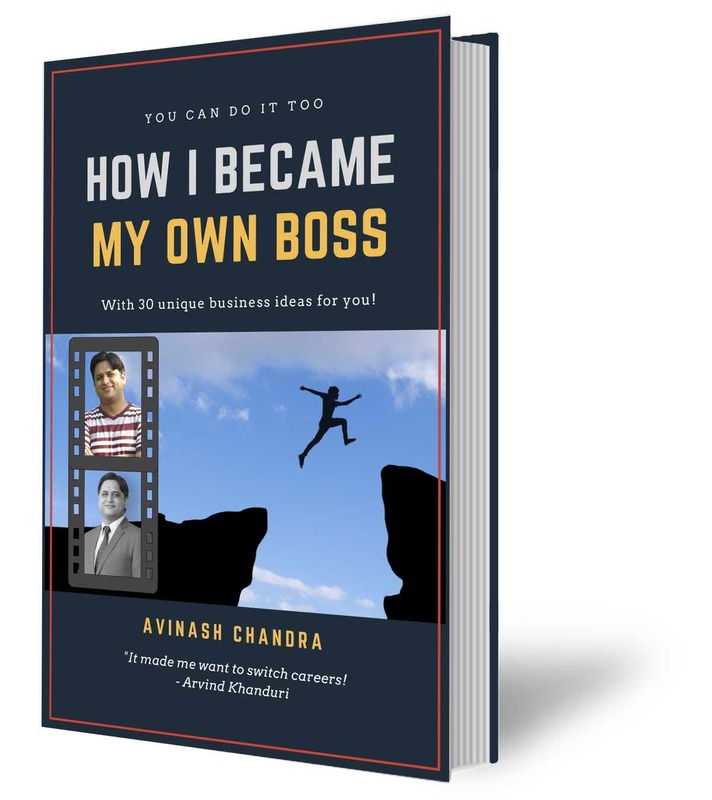 Your first blog is created & published! 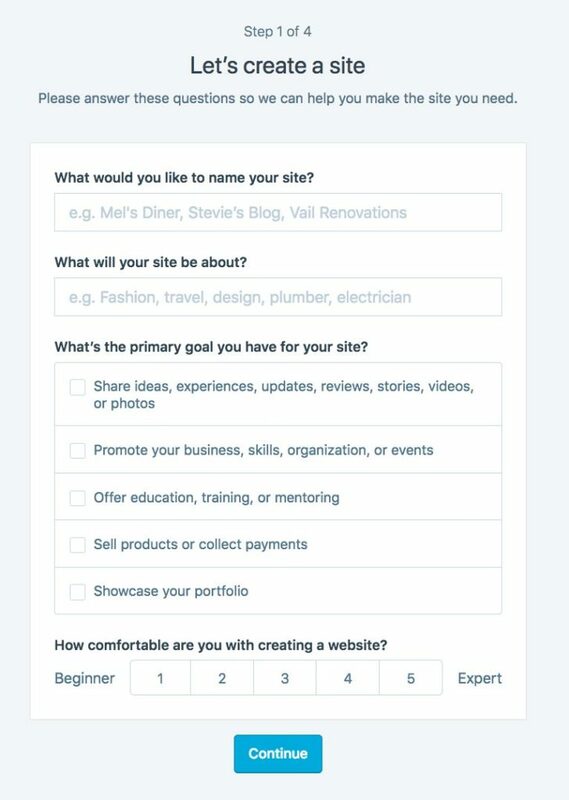 Once you choose the blog category, you will be asked to pick the kind of site you are interested in building. It could be a blog, online store, portfolio, etc. Select a new theme for your blog! 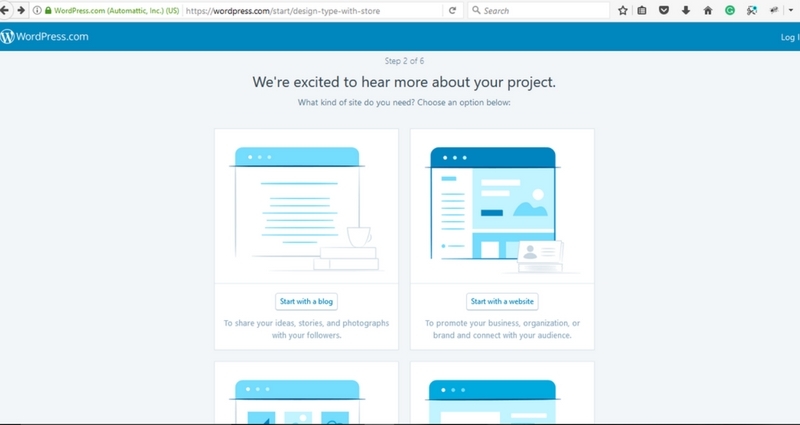 WordPress will start you off on a default theme depending on your choices. You need to choose a a different theme for your blog to look professional and to set yourself apart. A theme is basically a layout for your blog. WordPress will show you various themes for different kind of blogging needs. Based on your requirement you can choose one for yourself. You can change your theme by clicking on the “Themes” tab on the admin dashboard. Click on the Edit link to modify or delete this blog. You have options to add media or videos to your blog page. 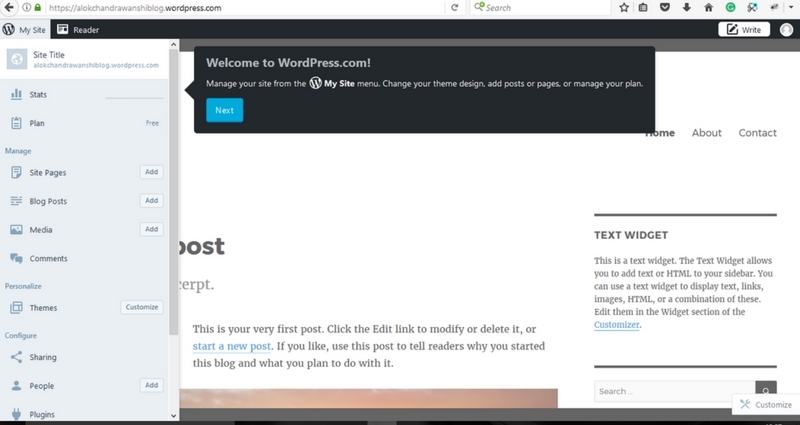 You can create a new blog post or add a site page with the options provided on the left sidebar. WordPress also provides inbuilt option to share your blog with social networks. With the premium plan, you can unlock the additional features to make your blog page more professional.